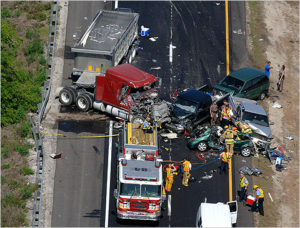 Any car accident can have serious or even life-changing effects on a person, but when an accident involves a semi-trailer truck or 18-wheeler, the chances of being severely injured increase substantially because of the truck’s massive size and weight. Both the driver and any passengers in a vehicle involved in an 18-wheeler or large truck collision can file personal injury claims against the at-fault truck driver and potentially against the trucking company. Trucking companies may be held vicariously liable for the negligence of their drivers if the drivers are acting within the course and scope of their duties and furthering the trucking company’s business purpose. They may also be directly liable for failing to train or supervise their drivers or for hiring and retaining a reckless driver. In Texas, anyone who is injured in an 18-wheeler accident can file a personal injury claim if they can prove that their injuries were caused by the negligence of the driver of the truck or the trucking company. People who are injured in an accident can recover the reasonable and necessary amount paid or incurred in medical bills, including future medical expenses, as well as lost income and earning capacity. Victims are also able to recover compensation for any mental anguish and pain and suffering they have endured, as well as punitive damages if the driver or the driver’s employer acted with grossly negligence by consciously disregarding a known extreme risk of harm. Issues that affect the liability case and a potential damages award include whether the police were involved, witness statements were taken, and photographs of the scene and vehicles were obtained. Police involvement can be a huge asset to a personal injury trucking case. Taking witness statements and contact information from anyone who may have seen the incident may also be incredibly helpful, especially if the case goes to trial. Photographs of the vehicles, involved parties, and injuries from the scene, as well as photos of the after affects and healing process of any injuries may also affect a potential award of damages. It is important to keep all documents including, insurance forms, medical bills, tow receipts, recorded phone conversations, and police reports can be very beneficial. At the end of the day, the severity of injury is the greatest factor in determining a settlement or jury award amount. However, other more nuanced considerations will come into play in this calculation, including the amount paid or incurred in medical treatment and how that care was paid for. Sometimes, medical providers and insurance companies who have paid for treatment relating to the injury may expect to be paid back some portion of the funds they have contributed towards the victim’s treatment. An experienced personal injury lawyer will know exactly how to negotiate with these entities to maximize their clients’ recovery once a successful settlement has been reached or jury award has been obtained. If a company only acquires the minimum limits, an injured person’s damages may be capped by that policy’s limit, even if his or her damages exceeds that amount. However, compensation above and beyond the insurance minimums may be available if the trucking company has assets to satisfy any judgment. It is important to hire a personal injury lawyer who is experienced with 18-wheeler or other large truck personal injury cases. The attorneys at Armstrong Lee Savage LLP are experienced and knowledgeable about the factual and legal issues that commonly arise in these cases. 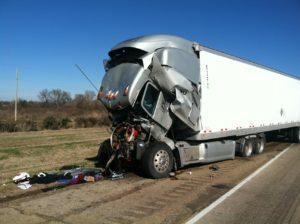 If you have been involved in an 18-wheeler, or other large trucking collision, please do not hesitate to contact our Firm today.